Deep in a secret, underground, experimental lab, one child refused to give up, searching for the means to create talking locomotives. No one knows what caused the lab accident. Some say he went to far... others say he didn't go far enough. But from the rubble they only found one survivor, the boy... and his train! Yes, somehow in the accident their bodies fused. They work together trying to find a cure, trying to undo the dark magic they've unlocked. But for now they wander the world delivering justice. They are... Child Thomas the Train Ride! (*lightening strikes*). Okay, admittedly, that is not the setup for Thomas the Tank Engine, but now that you've thought about it, wouldn't that be pretty cool? And it would be a great thing for you and your child to watch together! For now, we suppose you'll have to rely on you and your child's imagination (which we're told is pretty much limitless, so if child combined with boy lab accident isn't your'e thing, you can make up your own!). 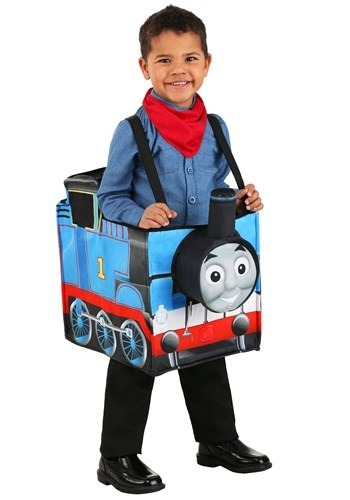 So suit him up and proclaim him Thomas as you chase him around the train yard. Percy and Toby will be green with envy at all the fun you two are having (Percy is already green, so he might not actually be jealous. It's hard to tell). Whatever you do, don't let him experiment with gamma radiation. We're not saying he'll be permanently fused with his favorite locomotive pal, but better safe than sorry.